Bitcoin Press Release: Blockchain gaming project TriForce Tokens have announced they will be releasing the first part of their technology RaidParty on 7th May 2018, through the release of the Wargate MOBA mobile game. A new partnership with TheGameWall Studios, in Cambridge has been integral to this launch. 2nd May, 2018. Milton Keynes, UK: Gaming project TriForce Tokens have announced they will be releasing the first part of their technology – the gaming app RaidParty on 7th May 2018. 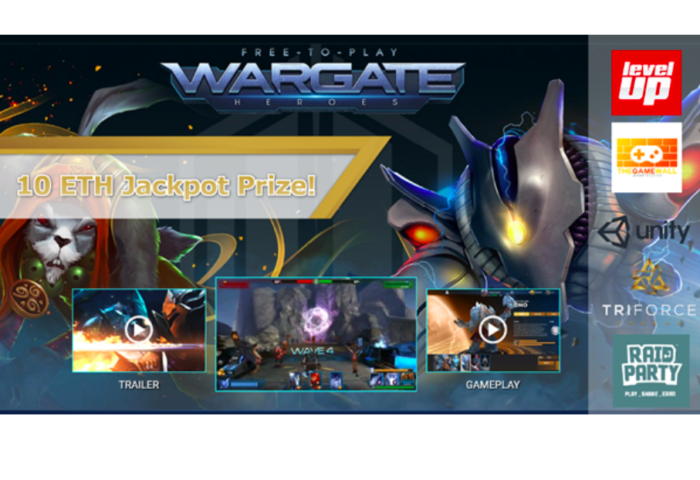 Prizes include a massive 10 ETH for one player to win, by playing their flagship game WarGate. WarGate is a fast paced 3 vs 3 multiplayer MOBA on mobile. To qualify entry for winning the top 10 ETH prize players must complete at least 10 matches within the 30 day reward period, to be entered into the prize draw for your chance to win 10 ETH. The release will be limited to the first 150,000 players; anyone can sign up on the RaidParty website here to have a chance of winning their top ETH and FORCE jackpot prizes. Other games and prizes include a 3 ETH top prize for one player on the addictive endless runner, called Twisty Roads. Players who get a higher score than 150 will be entered into the running prize draw. As well as the ETH prizes, players will also be rewarded free FORCE Tokens for completing certain tasks on a range of games being released, to be redeemed at a later development stage for gaming merchandise, exclusive access to content or even exchanged for other cryptocurrencies. The company behind this release, TriForce Tokens, are one of the original gaming cryptocurrency projects to bring a solution for gamers to actually earn crypto by playing games. This first product release is one part of a range of strategic gaming solutions being developed. TriForce have recently partnered with game publishing studio, TheGameWall Studios based in Cambridge, UK. TheGameWall studios has some serious experience in the games industry, having close ties to the rapidly emerging Latin American indie game market. Together with LevelUp.com and Tarreo.com all combined companies have a global reach of over 10 million gamers throughout their communities. Independent award winning game publisher studio, in cambridge, TheGameWall Studios has recently partnered with TriForce Tokens. The company has a core ethos to maintain a high standard of fun, innovative and quality products. The Studio have already successfully published amazing indie games, such as HUSH, Guns and Robots and much more. Raid Party is a social engagement platform for gamers, dedicated to connecting the entire gaming community together alongside TriForce Tokens; a platform on a mission to revolutionize online gaming by enabling gamers to earn FORCE tokens whilst playing the games they love and enjoy. TriForce Tokens recently opened up the option for users to sign up for their RaidParty App. Within one week of opening registrations, the platform has already seen more than 21,000 users signing up. With its unique approach on making the platform a place where not only game developers benefit, but players also enjoy the experience, and can win free cryptocurrency, a win win situation for all is found. This press release is for informational purposes only. The information does not constitute investment advice or an offer to invest. The TriForce Tokens token sale is closed to US participants and participants of all countries in which ICOs are not permitted. The post TriForce Tokens Launches Beta of Mobile MOBA Game Wargate and RaidParty App – Over 50 ETH and Free FORCE Tokens up For Grabs appeared first on Bitcoin PR Buzz.